Wearing: thrifted skirt, bag ; f21 top; payless boots. I decided to take a break from my insane packing mayhem and sneak in a few photos. in such a small space is a dreadful thought, but I have slowly been conquering it. In the next few days I will be quite busy packing, as I will be leaving on Tuesday afternoon. already but I do not plan to waste a second while I am there. about 50 on-the-go playlists on my ipod, haha. What song fits your mood right now? I love rain... gosh! you are so lucky (I want to go to the UK too!!) :D and always looking so pretty!!! i'll have to spotify some of that stuff, i love ghosts by laura marling :) when do you arrive in london? i've been hating the rain tooo. but umbrella photos are quite fun too. Brilliant outfit - love the boots! adore this! i think the blue stripes are perfect! this outfit is great! from the bow, to the stripes, and umbrella-nice addition! beautiful outfit, love the hair! I love everything about your style! And you are so good at posing! i love the top. and the shoes! omg i want them now. i wish it was raining!! it's really hot here. Your outfit looks great. So chic. Enjoy your trip! You look so lovely. And that bow in your hair is perfection! you look gorgeous. i love the first photo. omg making playlists is so addictive, i have one for travelling, one for america (how embarrassing), one for relaxing, one for sleeping (pointless). haha. i looove your hair in the second pic, so gorgeous. Eat a hamburger please. Do you have a problem? Great look! I love the bow in your hair, it looks so cute! No matter the rain, you look great. i like very much how you arranged the hair at the back. Very cute!! I adore this outfit of yours and I'm actually envying your rainy weather. I'm sick of all this heat in California. You're going to have such an amazing time overseas! Erg, hellza jealz. Nice playlist! I'll have to check out "Seabear," purely based on that awesome name. At the moment, I think Yacht's song "Psychic City (Voodoo City)" fits my mood. Check it out on YouTube, if you're interested. The video is a little kooky and totally does NOT fit my mood but the song does. the bow in your hair looks so adorable! First thanks for reading my blog.It's nice knowing that people actually do read what i write. Secondly, this outfit is amazing.It would be quite a problem having most of your clothes in luggages and also having amazing outfits, but you did it.This is the kind of outfit i would love to wear to school.I like the simplicity, yet the feminine feel.And the bow in the hair is just amazing. and i love the playlist! good taste in music! Stripes + black = perfect for a rainy day. aww that bow tie so cute on your hair! and its great you have some music on your blog! hey! i love your shirt! Adore this look, especially the striped top! I adore this look!!!! I love the bow in your hair. Lovely. Sooo girlie, so feminine, I love it! Eat two hamburgers while you\'re at it. Please. girl, you always manage to look so adorable love the stripes im in love with them !! i was looking at your playlist and i love love the v.u , i actually danced to one of the velvet's song in my wedding . cute outfit! i love the stripes. Such a lovely outfit, I love your skirt! You look so lovely, clean and chic. I love your cute Parisian look. So simple and chic! And the bow is adorable! Love your blog! I am def. following! Nice boots. They have a witchy feel to them, which I love. U are amazing, what a lovely blog, i am definitely one of your followers! Love this outfit with the stripes, this looks amazing on you and the ribbon in your hair completes it!!! It's raining cats and dogs here, but you are keeping it sweet in your little outfit. You look awesome as ever. I've never been to Ireland but I do know that Dublin is a wonderful city! Have a safe trip! I can't imagine two suitcases for my belongings. I would cry. my favourite song of all time is definitely First Day of My Life. It's beautiful, and so is your hair! How adorable! I love that bow in ur hair and that striped tee/sweater! U look beautiful! I like your striped tee!! And your hair bow! You look so sweet! Have fun! such a cute outfit! u remind me of vanessa carlton! Those stripes looks great with that skirt. And you have the perfect body for that outfit. great playlist .. and love the striped shirt.. .and bow ..and everything about the look .sorry if i left two comments i just cant seem to remember if i left a comment thelast time ,, but i def. wanted to so here i am again . gorgeous lady, i love this look, the bow is so cute! Love the lace up shoes and the stripes! I love your outfit! 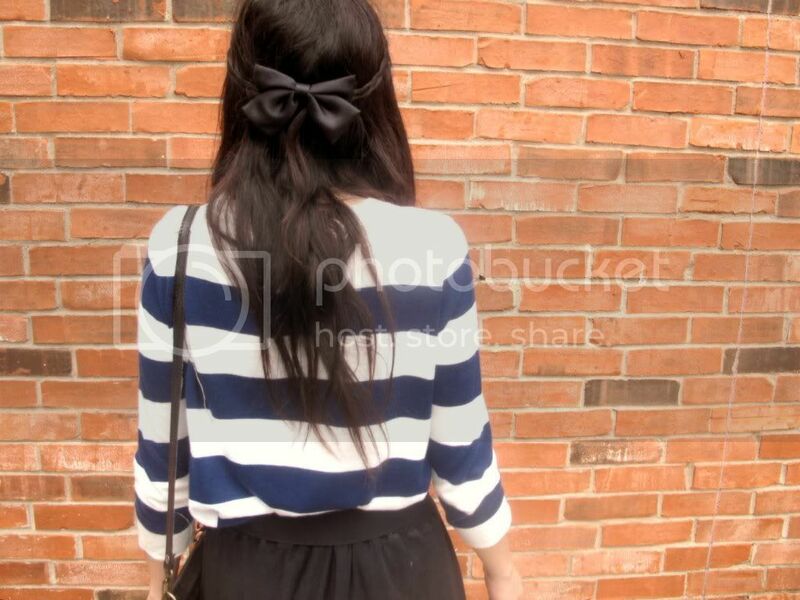 The bow in your hair is so cute. I love your outfit! You look amazing. Yay I'm the 100th comment! :) I love that outfit. Incorporating the umbrella was so cute. Thanks for sharing your playlist. I am always on the hunt for great new music and this will help a TON! thanks darling! i hope you had a good weekend! you look amazing. cute hair. the outfit is cute.but what i want to tell u is that i also love ''candy says''.actually many of the songs of vu.interesting playlist! Adore the bow in your hair,so beautiful ! And in love with this outfit,the bag and those shoessss ! thanks for the music suggestions! and love the stripes!!! Obviously the outfit is perfect as per usual.. but the bow is just so cute!